Wow! History rocks indeed! Never knew of this tho. Thank you for posting amazing stuff and please continue to do so!! thats pretty cool! loved the picture too! Yes I expect something similar still goes on in various parts of the world. oh my gosh I have wondered this for the longest time! Do you Brits really say I ‘will knock you up in the morning’? Can’t say it’s a phrase I hear a lot these days JJ but folks did used to say it. Who would knocker-up the knocker-upper? The knocker-upper knocker-upper? A mighty fine question indeed! I expect that the knocker-upper of all knocker-upper’s would knocker-up the knocker-upper. But of course you are still left with the question of who would knocker-up the knocker-upper of all knocker-uppers? Could it be the knocker-upper of all knocker-uppers of all knocker-uppers? But here you see….same problem. Who would knocker-up the knocker-upper of all knocker-uppers of all knocker-uppers? EXACTLY what I was thinking. 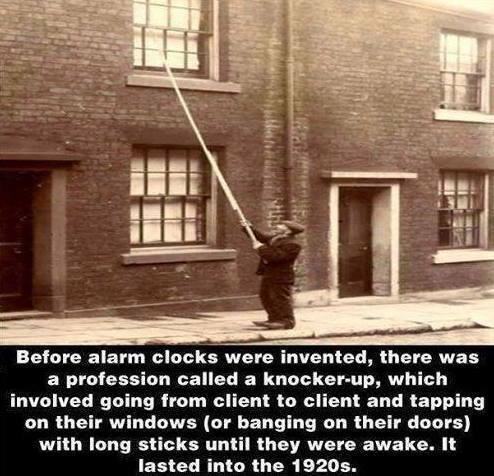 You’d actually need a 24 hour rotating system of knocker uppers for it to work. You could probably employ a whole town just to wake each other up so they in turn could wake each other up again. A knocker-upper economy? Could work? Weirder things have! … I am having a drink lol! Wow this is so crazy, and to took where we are at now! Little hand held devices that sort out just about anything and everything for us! It’s nice to see progress at least in some areas eh? hahaha! this is new to me. Another instance where technology replaced human beings. Definitely sorts out the snooze-button problem! Fear not Diana, it has the same meaning in the UK! Plus I am in love officially…Chucho and Chiki! Ah, the hard part of of your job! Well hang in there soldier! Hopefully great things will emerge also from the journals of your many trips on your blog. I think they still exist, to be honest…… during the adolescent years of some lives. “The Mother / Father”, societies original knocker-uppers. An interesting note. I didn’t know it was a common practice but I have a book titled, The Wheelwright’s Shop, and it tells about there being a ‘knocker up’ for the mill employees. The book is about building wagons in early England and would be of interest to older men but not as appealing to women as correct flower arranging. Now there you go! Interesting stuff! Although not sure about the flower arranging! Seeing that 20+ people have liked this post already, I suddenly realized that my original comment is probably the 20th in that general vein of thought! Oh well! LOL.